Mr Ehm is an experienced and successful resource sector executive with more than 40 years of diverse experience in mine operations and project management, covering the nickel, phosphate, copper, uranium and gold sectors. He has forged a long and successful career with major global gold miner, AngloGold Ashanti Ltd. 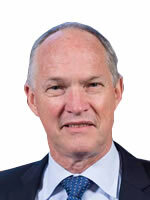 He is currently Executive Vice President for Group Planning and Technical and prior to this appointment in 2013 served as Executive Vice President of Australasia overseeing the development of the Tropicana Gold mine in Western Australia. Previous senior roles with AngloGold Ashanti include Executive Vice President of Tanzania, General Manager - Sunrise Dam Gold Mine, General Manager - Union Reefs Gold Mine and Project Manager - Boddington Gold Mine. Mr Ehm was a Non-Executive Director of Mining3 (previously CRC Mining) and served as Non-Executive Director of the Minerals Council of Australia.